If you looked at a list of world countries by area, you would see our previous entry Austria, and one spot above: Azerbaijan. Azerbaijan. The name alone brings back the cold sweats of spelling tests. But what do we know of this land or its peoples? “It’s one of those Russian-y countries that’s not really Russia anymore I think”… “Isn’t it by like Georgia or something?… No, I don’t know where Georgia is.” These common refrains have stood for too long! Although to be honest, those were probably quotes I myself have uttered in the past, but no longer. It is located on the Caspian Sea, is part of the Caucuses, and has the capital of Baku. The country name itself has an interesting history dating back to the time of Alexander the Great and often translates to “land of fire”. This is a reference to the oil fires burnt in the temples of Zoroastrianism. They briefly had independence from 1918-1920 before being incorporated into the Soviet Union, however those scant two years were very important. The Azerbaijan Democratic Republic which existed has the distinction of being the first secular and democratic republic in the Muslim world. The country also proclaimed its independence two months before the official dissolution of the USSR in 1991. What I’m saying is, they have always been on the forefront of cultural change in a very static region. Their cuisine shares characteristics with many others from that area of the world. Pilafs are very popular, as is the plenty of fresh seafood. That being said, mutton and beef are also indicative of Azerbaijani fare. Since I am clearly on a lamb kick…let us venture forth! 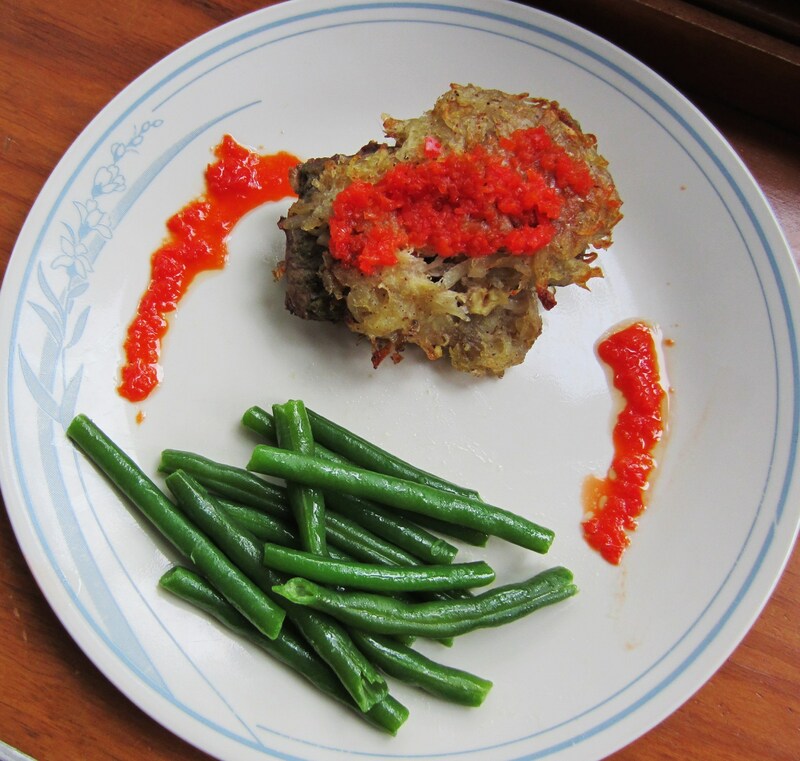 Now, if you had asked me to name the dishes that eggplant could be used in up until recently I would have said “Eggplant Parmesan”…then paused for a while and excitedly said “Oh! Baba Ghanoush!”. I feel as though most people would say the same, but as someone who prides themselves on being generally knowledgeable and a food lover to boot, that just won’t cut it anymore. Here is another application of eggplant, once again in the same part of the world as we have seen it featured time and time again. Instead of simply being mashed this time, the vegetable in question is fully incorporated into the main dish and really shines. I like this dish for a few reasons. It is very healthy. If you choose your cut of meat wisely there doesn’t have to be an overabundance of fat, however some will of course lend unctuousness to the broth. The most interested reflection I have on this is that when cooked correctly the eggplant takes on the gelatinous consistency of fat. I know that sentence sounded disgusting and I apologize, but I meant it in a positive way. It allows you to have the sensation and texture of fat without the detrimental health aspects. One of the nicest parts is that this is a one pot dish and very easy to make. You simply stack your ingredients and let the heat and steam do the work. I also continue to appreciate the use of peppers more and more. I would highly recommend this dish for any time of the year as it was delicious. Next up…the Bahamas and a Lord of the Flies favorite! PIGGGGY NO!!!!!! Cut the meat into bite-size pieces. In a large saucepan, add butter and cook the meat over medium-high heat until it is lightly brown on all sides. Then, add approximately 1/3 cup of water and season the meat with salt and pepper. Cover the pan with a lid and let it simmer over medium-low heat until the meat is almost cooked. Stir the meat occasionally to prevent it from burning. Remove the stems of the eggplants and peel the skin lengthwise in approximately ½-inch strips. Slice the eggplants, tomatoes, and potatoes into circles (approximately ½ -inch thick). Slice the bell pepper and onion into half circles. 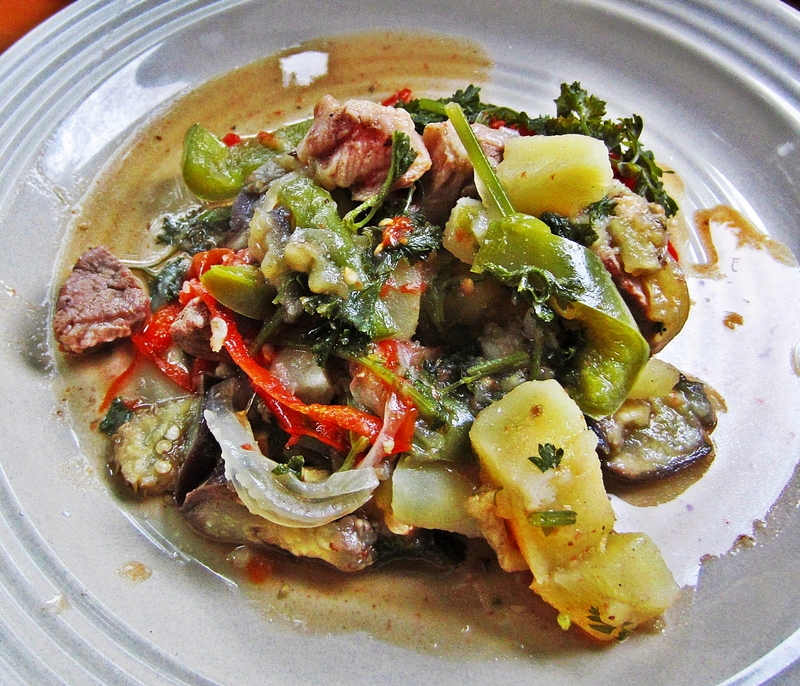 Place layers of sliced onion, potatoes and bell pepper on the meat. 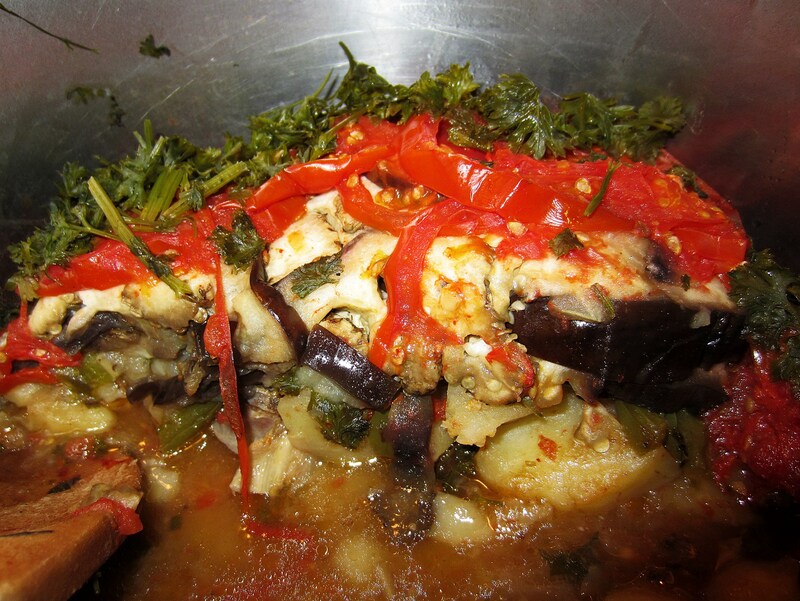 Then place layers of sliced eggplants and tomatoes, and top it off with chopped parsley. 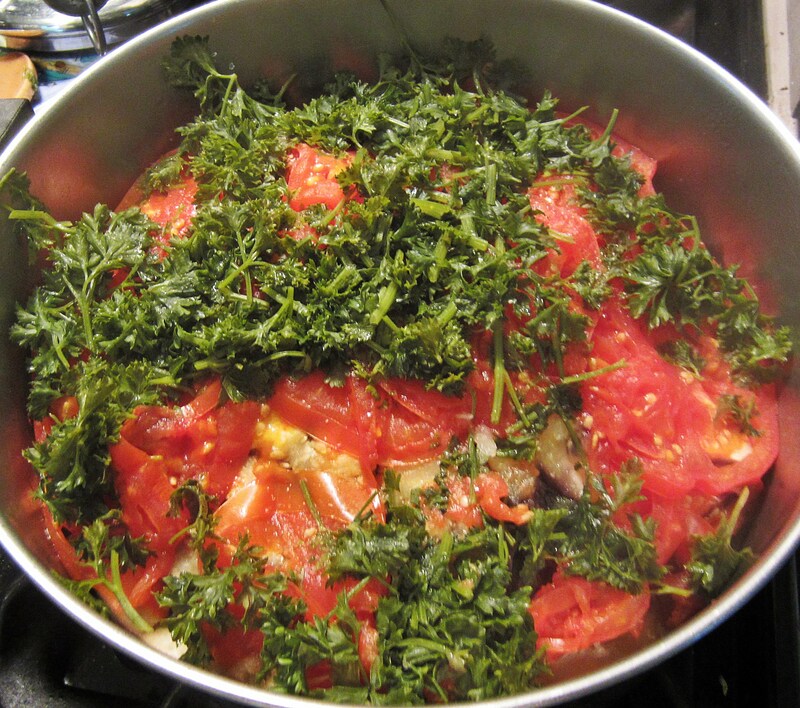 Cover the saucepan with a lid and steam over a low heat until all the vegetables are tender. At the end, add salt and pepper to taste.